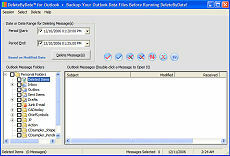 DeleteByDateRange is a Great Way to Control the Size of Your Outlook Files. By the time we get around to disposing of old messages, or to archiving them, there can be more messages which are ready to be deleted than there are to be saved. In Outlook deleting messages in bulk across folders can be a tedious process - and the more unpleasant it is, the more likely we are to delay it even more! DeleteByDate transforms message deletion into a rapid, automated operation - just what the doctor ordered! Tired of Ten Steps to Delete Messages in Bulk? DeleteByDateâ„¢ lets you select messages across folders in one operation. Choose messages by a single date, or by a range of dates, and delete all your unwanted messages easily and quickly, without the tedium of Outlook's "Ten Step" program! Once it's time to archive, why archive messages you don't need anymore? Right before you archive is the perfect time to delete messages you don't need - but it could take a long time to delete a lot of messages if they're in different folders. Using DeleteByDate puts you in control by allowing you to select all the messages you want to delete at once, in one simple step. Placing a checkmark in a folder's checkbox will mark all of that folder's messages - and all the messages in subfolders of that folder - for deletion according to the date parameters you set in the "Set Deletion Date" area of the program's interface. Purchase DeleteByDate now or try the fully functional 30-day trial! NOTE: A license code must be obtained online to run the trial version of DeleteByDate. Instructions on obtaining your code are here.